Mock-up of a futuristic transportation pod looks a bit like the cabin of an airliner, but with a crucial difference. If you've ever wondered what the inside of a hyperloop capsule might look like, you're in luck. Newly released photos of the interior of a full-scale capsule mock-up that went on public display in Dubai in February show a cabin that looks like that of a modern airliner but sleeker, if a bit more confined (scroll down for more photos). Designed for a route between Dubai and Abu Dhabi, the futuristic-looking pod prototype has room for five passengers in first class and 14 in economy. 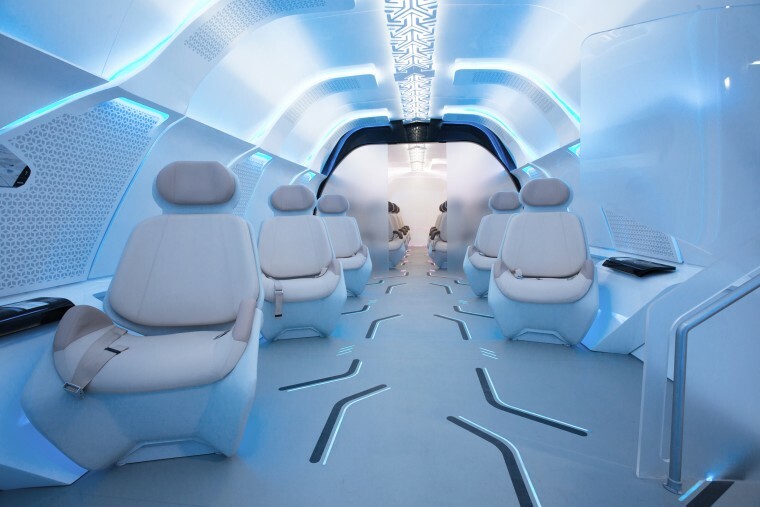 In first class, there are digital displays, temperature-controlled leather seats and touch screens that let passengers adjust the lighting from blue to pink, according to the website of Designworks, the Los Angeles-based consultancy that worked with Virgin Hyperloop One and Dubai's Roads and Transit Authority to create the mock-up. One thing missing from the proposed capsule is windows. That's not surprising for a vehicle designed to zoom through sealed vacuum tubes at speeds approaching 700 mph. But it challenged the mock-up's creators to find ways to "create a windowless cabin without causing a sense of claustrophobia," Designworks designer Adil Ali told NBC News MACH in an email. Ali said the prototype cabin's ambient and direct lighting are intended to create "an uplifting and sensory experience" to help keep passengers copacetic, as are the seats, which are designed to appear as if they are "floating on air." If passengers do feel hemmed in, they won't for long. The 87-mile hyperloop ride between Dubai and Abu Dhabi is projected to take about 12 minutes — although it's unclear when the route might open. The same trip takes about 90 minutes by car. Virtual windows, which use video technology to simulate passing terrain, have been proposed as a means of calming anxious hyperloop passengers. But even hyperloop partisans acknowledge that some people might be squeamish about traveling via a fast-moving, windowless pod. "The ride experience will not be for everybody due to speed and small compartments," Dane Egli, president of Hyperloop Advanced Research Partnership, a Colorado-based nonprofit formed to advance hyperloop technologies, told MACH in an email. But "consider the evolution of American rail and aviation transportation systems and how train and airplane compartments developed over the past 150 years to become more passenger-friendly," he said, adding that hyperloop pods will evolve. Elon Musk first proposed the idea of high-speed travel through vacuum tubes in a 2013 white paper. Since then, several firms have begun developing and testing hyperloop technologies. In addition to Virgin Hyperloop One, these include Hyperloop Transportation Technologies, which announced last year that it had begun construction of the world's first full-scale passenger hyperloop capsule. Numerous hyperloop routes have been proposed, including Chicago to Cleveland and New York City to Washington, as well as between other cities in the U.S. and in other countries. All that activity is a good thing, according to Egli. "The congestion and pollution currently plaguing our highways, maritime ports, runways and rail systems are unsustainable and require a new solution that is fast, affordable, clean and safe," he said. "That's the primary capability and imperative for hyperloop. If America doesn't build it first (like the Wright brothers with manned flight), then Europe and others will build it...which they already are!"